Opposition parties have criticized the ruling party chief’s recent remarks on Vietnamese women, demanding an official apology. The ruling Democratic Party of Korea’s chief Lee Hae-chan was quoted as saying, “Many Korean men marry Vietnamese women as they prefer them over women from other countries,” during a meeting at the National Assembly with a high-level Vietnamese delegation headed by Vietnam’s Deputy Prime Minister Trinh Dinh Dung on Monday. 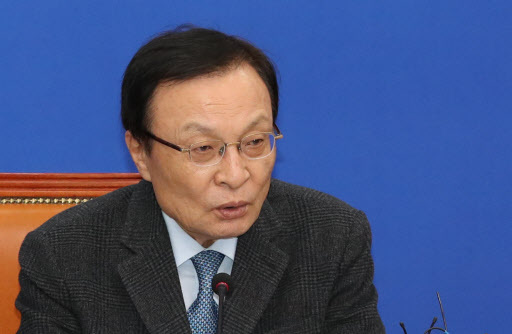 “The remark came from Lee’s lack of understanding of women and gender sensitivity,” Liberty Korea Party spokesperson Song Hee-kyung said, urging Lee to apologize for making the sexist comment. “How could the chief of the ruling party say such things? Lee trashed Korea’s national pride in a trash can,” Bareunmirae Party spokesperson Kim Su-min said. The ruling party, however, downplayed the criticism. “Deputy Prime Minister Trinh Dinh Dung said that many Vietnamese women are marrying Korean men, and it’s true according to data from Statistics Korea. Lee made the remark in an attempt to agree with the minister,” the ruling party said, adding that it is concerned that such outcry could cause diplomatic problems.